Christmas came on Friday. I apparently was a good girl. 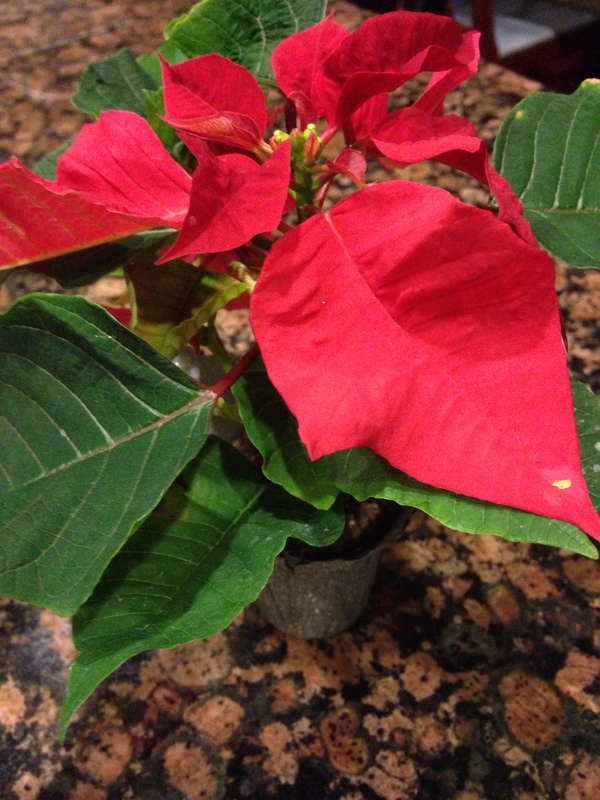 This would be the cutest and tiniest poinsettia I have ever seen. Someone thought I would love it. They were right. 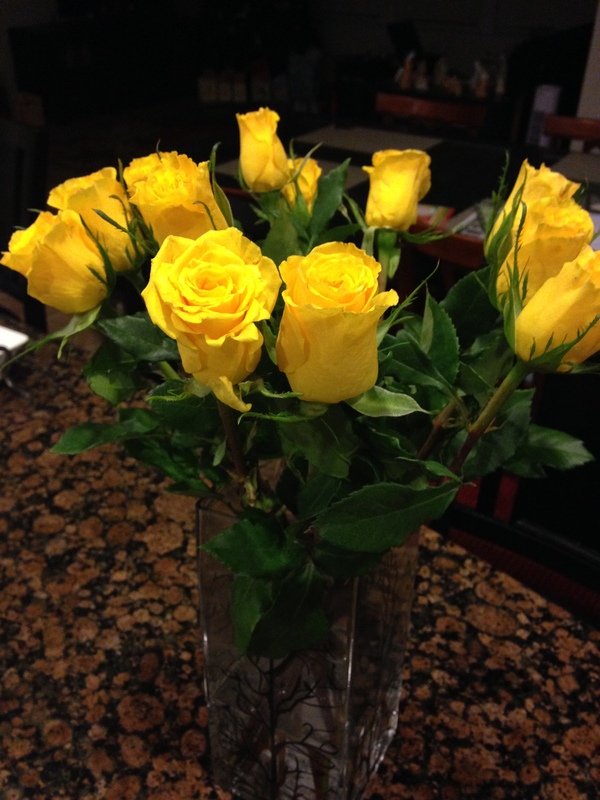 Beautiful perfect yellow roses. My sorority flower and yellow rose of Texas 🙂 Apparently my sister doesn’t own a vase and all of mine are in storage. I had to dump her kitchen utensils out of this. I think it’s a vase she was using as a crock. 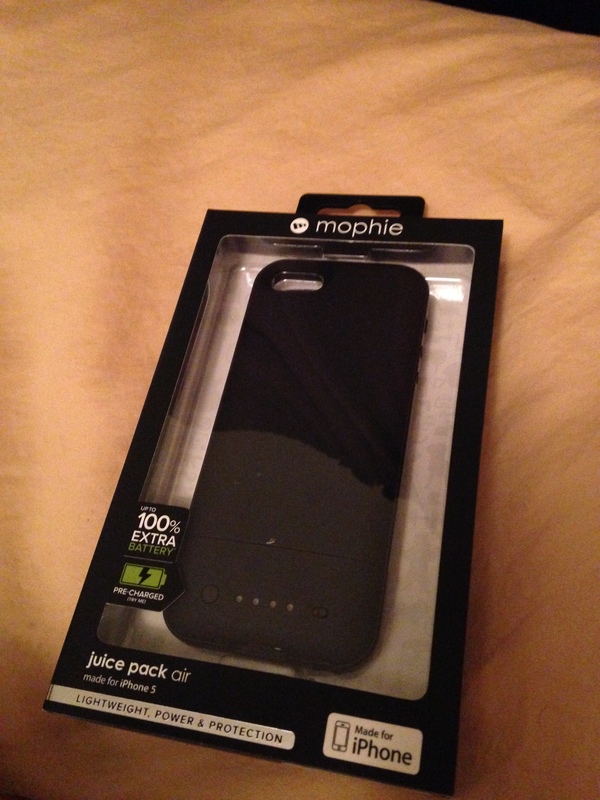 A mophie for my iPhone! My phone is always low on battery, because I use it too much. Overnight and during work I charge it all day long, but other than that, it’s drained. I like this because the case comes apart and with the bottom off, it now fits on my docking speakers. 🙂 Very thoughtful. More important than any gift was memories made and precious time shared. Happy heart. Sometimes you have to go a little out of your way to say you are thankful for something. And if you are truly thankful, the time, distance, and pretty much everything else don’t matter. I spent majority of my day yesterday saying I was thankful for one blessing in particular. I am still smiling. Dan and I rang in the New Year in the booming metropolis of Schulenburg (1.5 hours away from where we live). We were going to have dinner at the venue, but prime rib was on the menu and i’m not a fan. So then we’d planned on Frank’s, which is apparently not open on Mondays. So we opted for Oakridge, which was interesting. We stood out like sore thumbs as non-locals, lol! 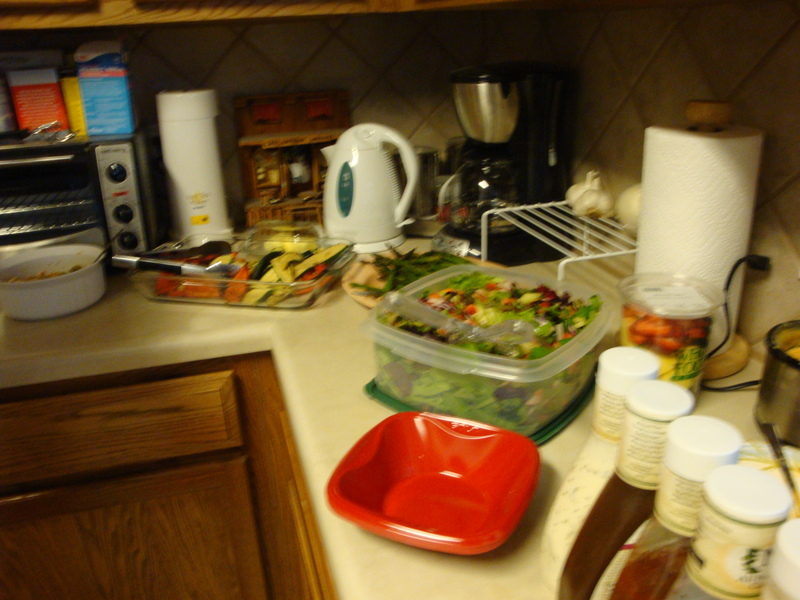 I wasn’t thrilled with the food, but the salad bar was ok.
Fred was really funny, i’d love to see him again. The crowd was different, which was nice. Older and very loyal fans. Dan kept saying how awesome it was to go out and feel so young! The night was finished off with a champagne toast and singing. Rocking the glow-stick accessory over my wound bandage. I drove us through the Whataburger drive-through and back to the hotel in the rain. It was only my 2nd time driving the Jeep and i’m still getting used to driving a standard again. We lived and I didn’t run into anyone or anything! On another note, I CANNOT WAIT until Dan gets back from skiing in 2 weeks and that beard comes off! I HATE THE SKI TRIP BEARD. I enjoyed being off today, but not sure how much I am going to like going back to work. I have alot to do and I am eager to get it done, so that’s not it. It’s the fact that today feels like Saturday. So my mind already was thinking about Sunday type things for tomorrow, lol. More like a 2nd Monday in reality. Woke up and chilled for a bit. Email, coffee, breakfast. Then I decided to tackle Grand Mesa, which is the part of our neighborhood that has all of the estate homes and giant hills. While it felt good to run at 7:30, I really should have started that route sooner. As soon as I approached the biggest and longest hill, the sun beat down on me. I finished and it was strong overall, but I could have done without the sun. 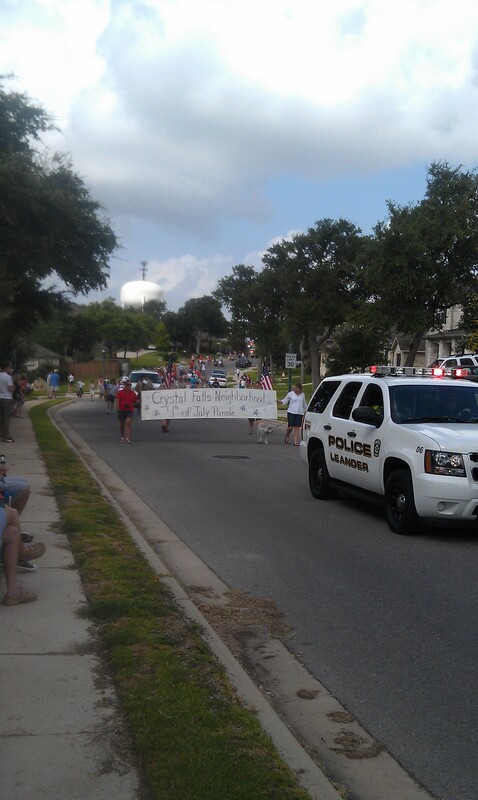 Then I showered up and went to our neighborhood’s parade. 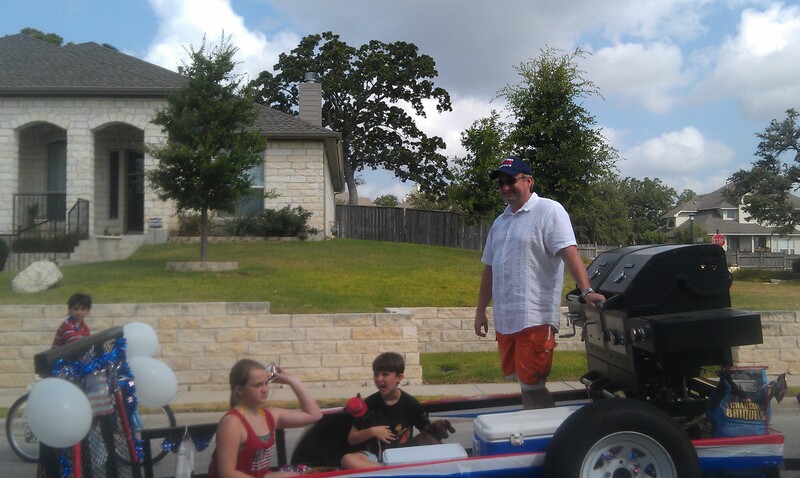 The new mayor lives on the next street, here’s his sorta-kinda-float. More like a “a creative way to get my kids and pit to the grotto pool taking the long route with a trailer” type of float. 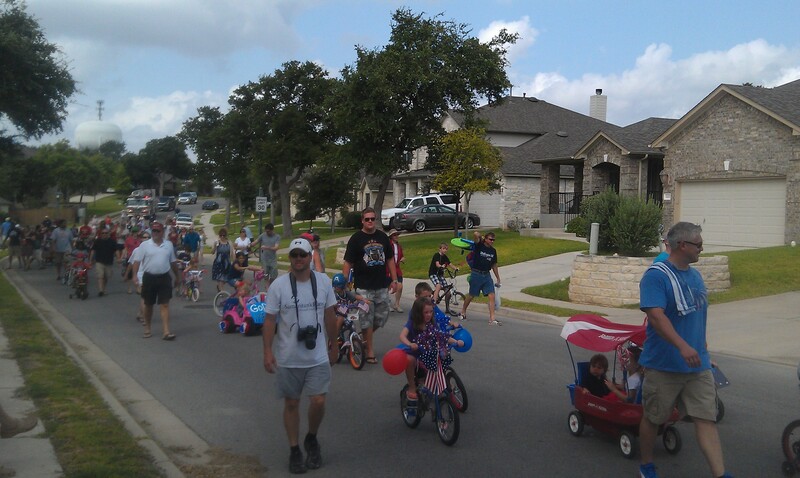 The parade is really for the kiddos, more of a bike and doggie parade. 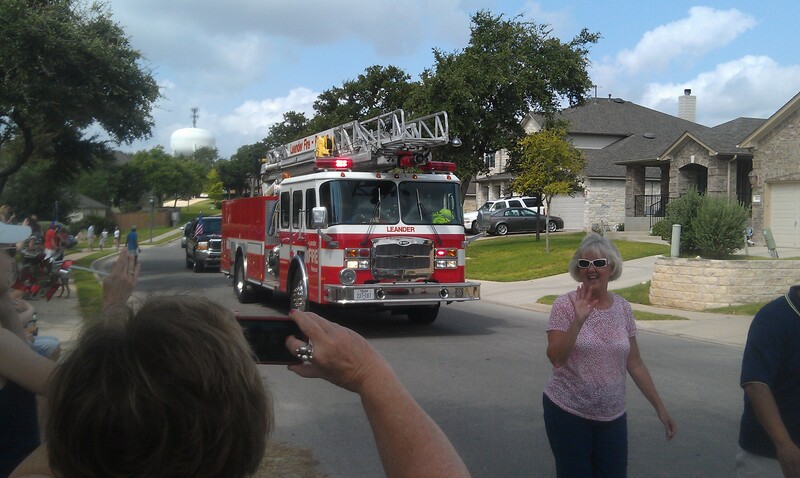 Plus the Fire truck from the station in Grand Mesa part of the neighborhood always comes. Then it was home to wait for Dan to wake up and then off to Rudy’s down south to pick up lunch. It was the idea everyone had! I knew it was going to be crowded, but man, it was insane. There was at least 50 GROUPS of people in front of us. 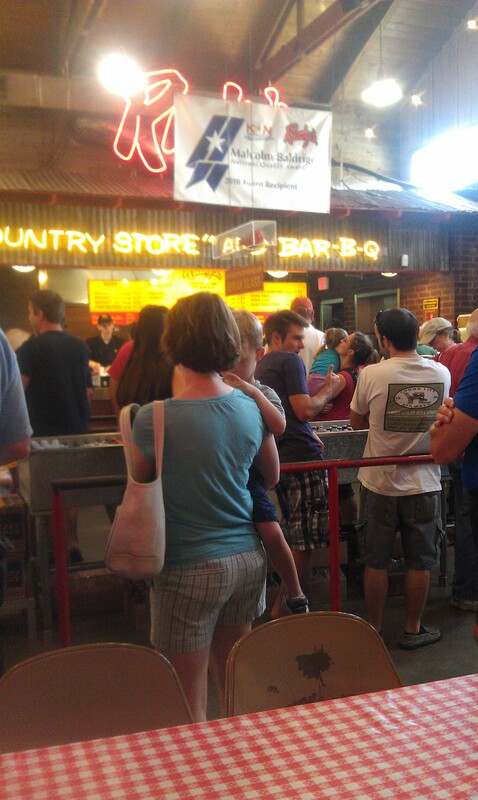 Good thing Rudy’s is usually really fast with their lines and crowd control. 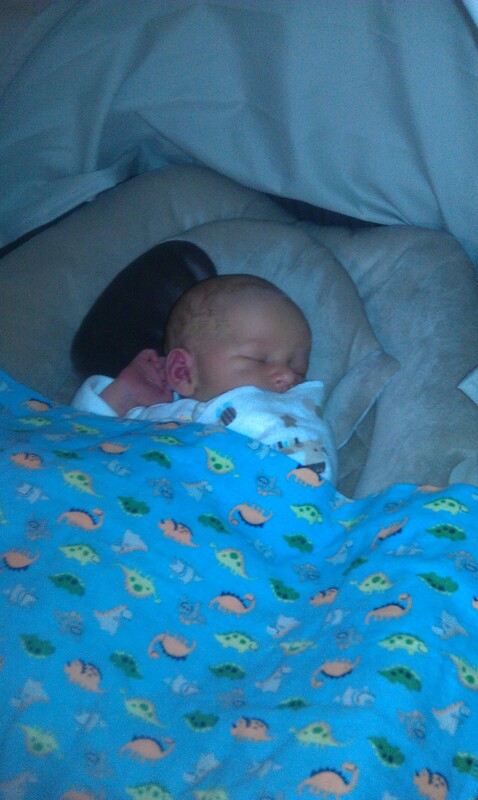 We eventually got to our destination, to see baby Hayes and his mommy and daddy. Hayes was born last Wednesday. We took them lunch and enough extras for a few meals. 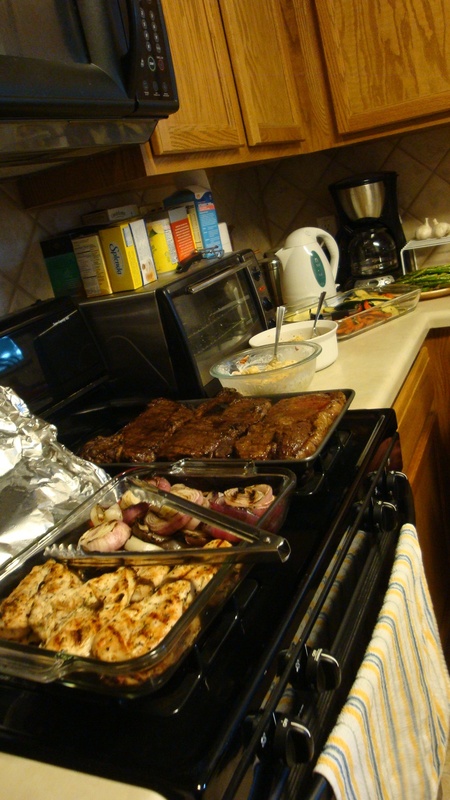 I think we got some of everything, we had quite the spread! Hayes didn’t really like me. No babies like me. He cried as soon as I touched him. I am not maternal at all, unless you are a cat I guess. I am sure all of our other friends who have held him already didn’t experience it. Dan didn’t go within 10 feet of the baby, I could tell he was freaked out. 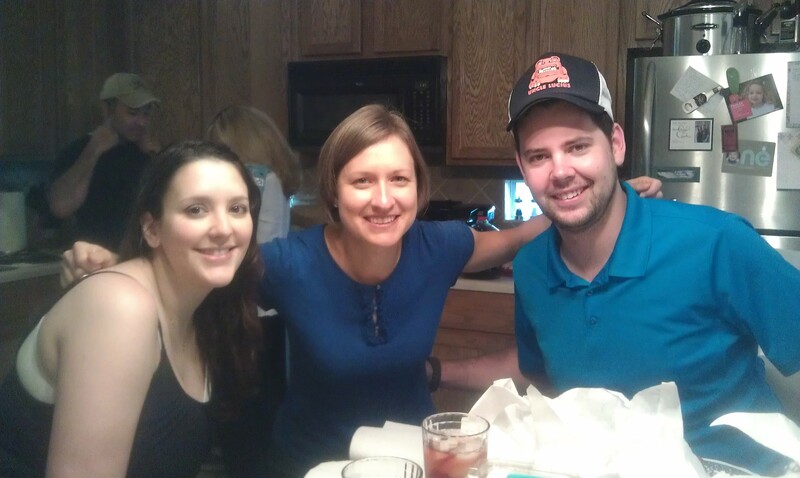 Lunch was great, got to visit with mommy and daddy while Hayes napped. I stopped at Central Market on the way back North, since I NEVER get to go. Dan didn’t really seem to be too happy about that, so I did a quick stroll and I bought an apple. Yes, just an apple. I wanted to browse, but I could tell he wanted to go. *Sigh*, maybe next time I am in the area, i’ll be alone and can actually shop. So home it was. Dan is playing plumber and trying to fix our leaking toilet (internal leak) for the 2nd time. I am sitting around trying to figure out what to have for dinner. Since we have no propane, it won’t be grilled! 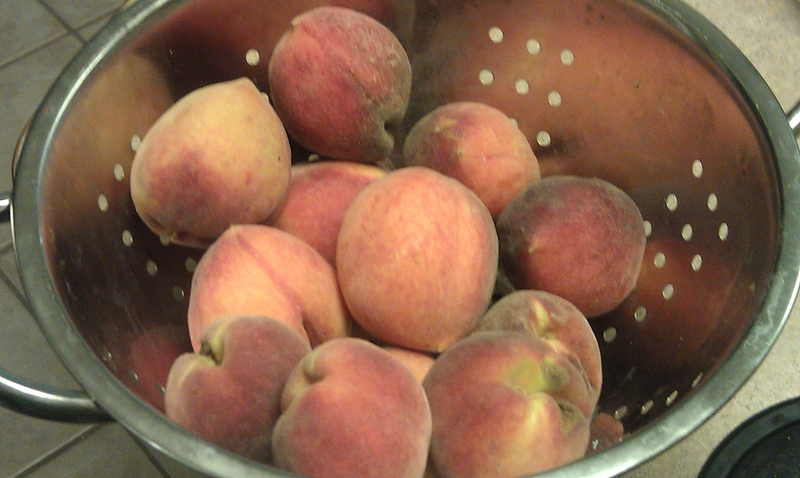 After Father’s Day dinner, my dad gave me all of this from his garden…..
Peaches. 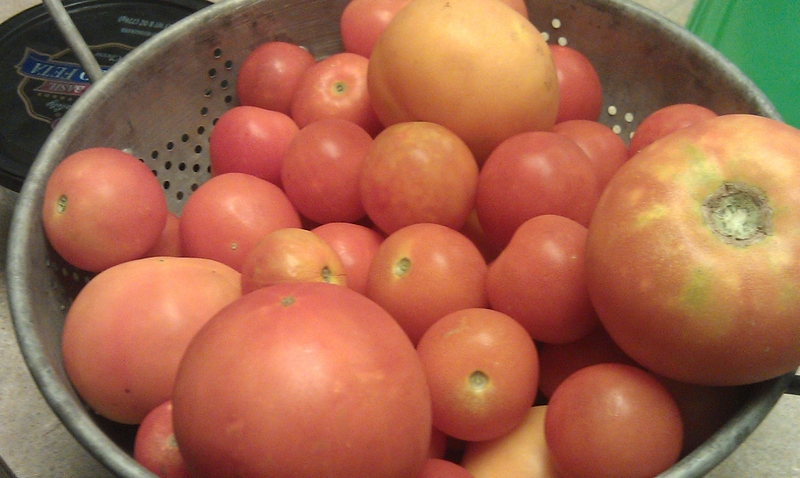 I cut and froze 4 quarts, left the rest for snacks and desserts. Ate 2 of them yesterday for breakfast in a dessert omelet. Spaghetti and butternut squashes, with a few acorn. A huge bag of jalapenos and some onions aren’t pictured, but will be enjoyed. I cooked 2 spaghetti squashes on Sunday and froze them. Cooked another for for Sunday dinner and Monday lunch for me. Regular pasta for Dan, because he won’t eat spaghetti squash. It turned out great! 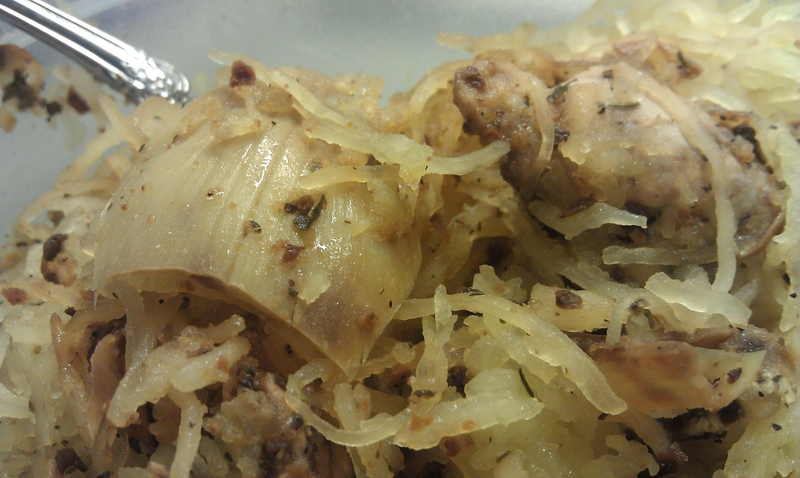 Chicken breast, artichokes, sundried tomato seasoning kit mixed with EVOO, (the tomatoes, onions and squash) are from his garden. It was delish! Not the prettiest dish, but very tasty with so much flavor! Mediterranean salmon warm salad. 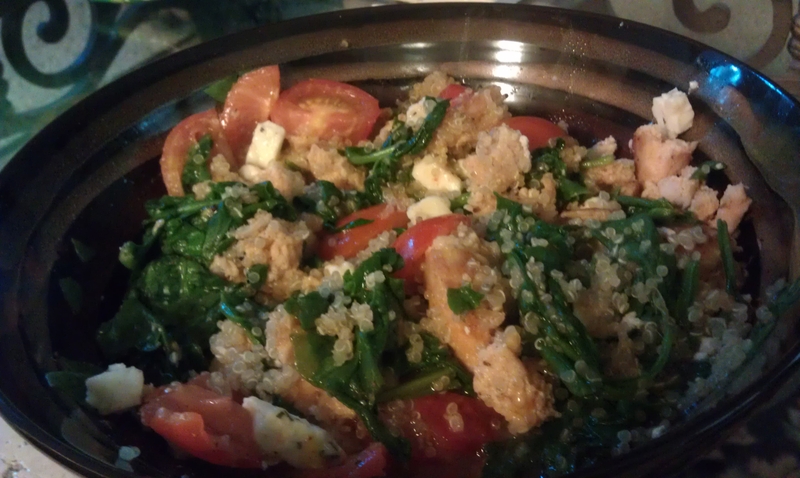 Salmon, spinach, EVOO, (tomatoes and onions from the garden), feta crumbles, and quinoa (cooked in chicken broth). 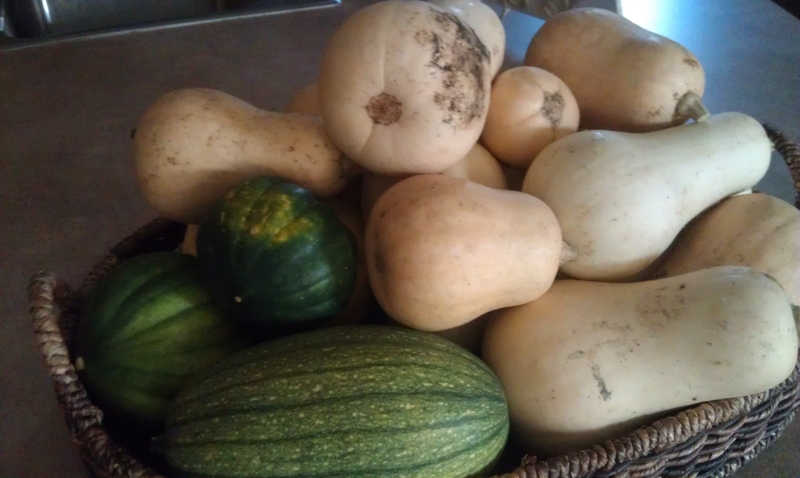 I haven’t cooked any of the butternut squash yet, I may put that on the agenda for Wednesday. There is too much to eat, so i’ll have to cook and freeze some of that too. Looks like some kitchen adventures are in store for me on Wednesday evening! Dan and I haven’t done traditional Easter celebrations for the last few years. Last year we attended a baseball game. 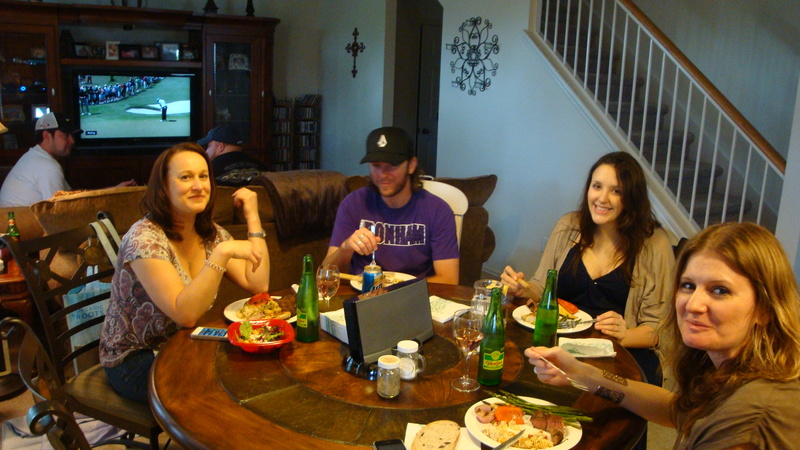 This year we decided to have brunch with some of our Austin friends down south. Hit the gym first, which was nice and empty. My calves are knotty again 😦 I am going to blame that on why for the first time EVER, I lost my balance on the Bosu and had to jump off 😉 I foam rolled after that, but what it really needs is Trigger Point. Then it was off to Heather’s house. Dan had to wake up earlier than noon, lol! He a good sport about it though and was a huge help prepping the salad for me while I made the guacamole (this took forever, we added a ton of stuff to the salad). He is so precise and good at chopping, I need to recruit him more. The guacamole which was a kit from HEB was very spicy and chunky (which I loved). Glad I bought 4 of them and froze the others. We all brought a few things, but Heather really outdid herself! 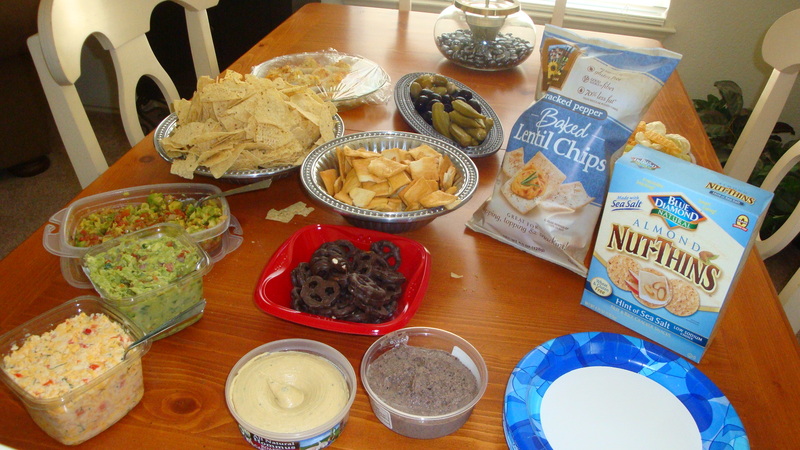 We had tons of different dipping options, dips, 2 kinds of REALLY spicy guacamole, 2 different types of hummus, veggies, pickled veggies, and more! I think I ate most of that pickled okra 😉 And she got Baby Zach’s hummus and some gluten free options for dippers! Steak and lemon-rosemary chicken for the main dish. I loved that chicken. 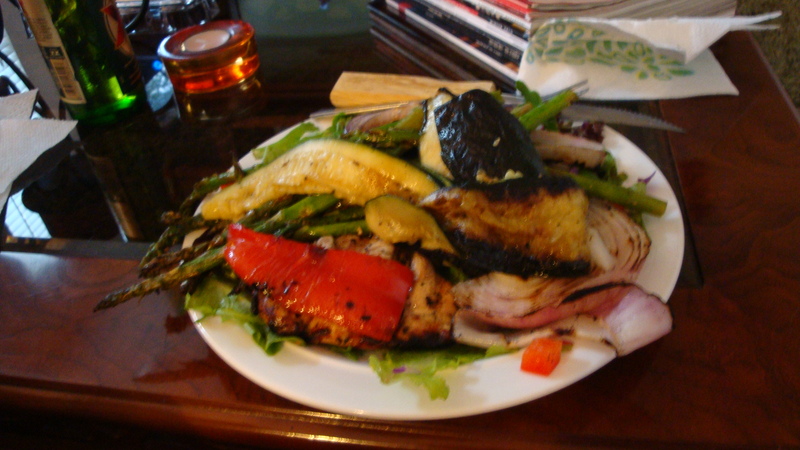 Grilled veggies are like crack, that’s why they are spilling all over my plate. Fun filled Easter. Dan and Devon are in the living room, along with my mega plate. 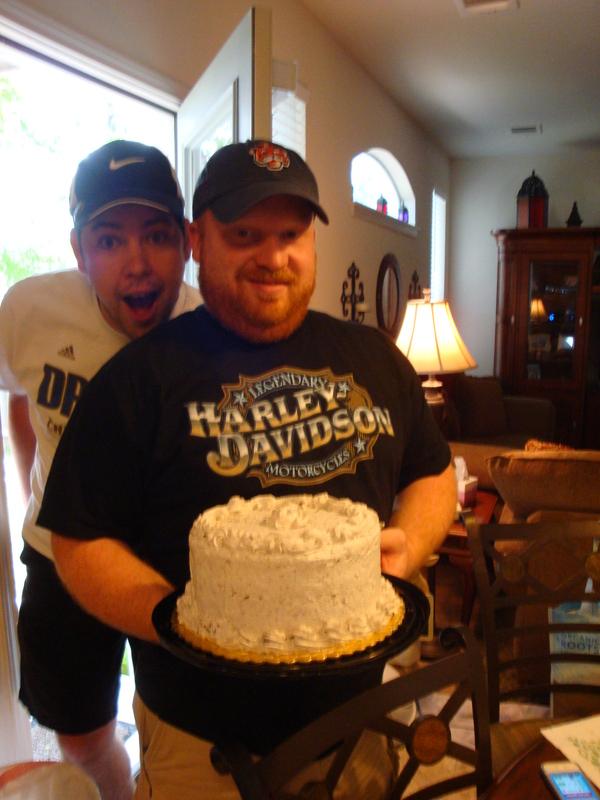 Cookies and cream ice cream cake for Dan’s birthday for dessert. HUMPF! He just had to pick a flavor of ice cream I can’t eat. 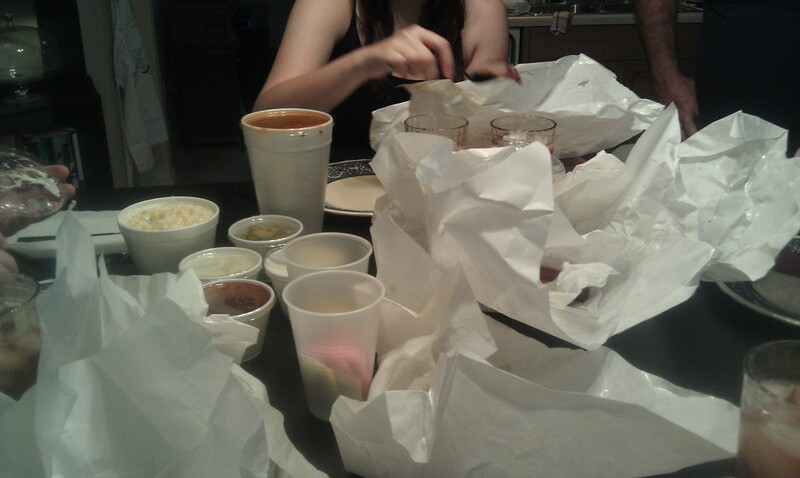 She said we could take leftovers home. I hope I left enough for our other friends, I didn’t want to make dinner Sunday night OR lunch on Monday. We’d planned on driving up to Florence after that (hour away) to meet his coworker and his family for some target practice, but we left too late. Instead Dan took a nap and studied for his test. I did laundry, extra-curricular activity work, and cleaned. I tried to pack for our trip, but I ended up with a mess on my bed instead.